I do enjoy lunches so much. Here are two of my recent favorites. Birthday Lunch. The first was to celebrate my birthday a few days ago. I had gone to the North End the previous week to replenish my supply of the best dried porcini (1/2 kilo bag and a small bank loan). 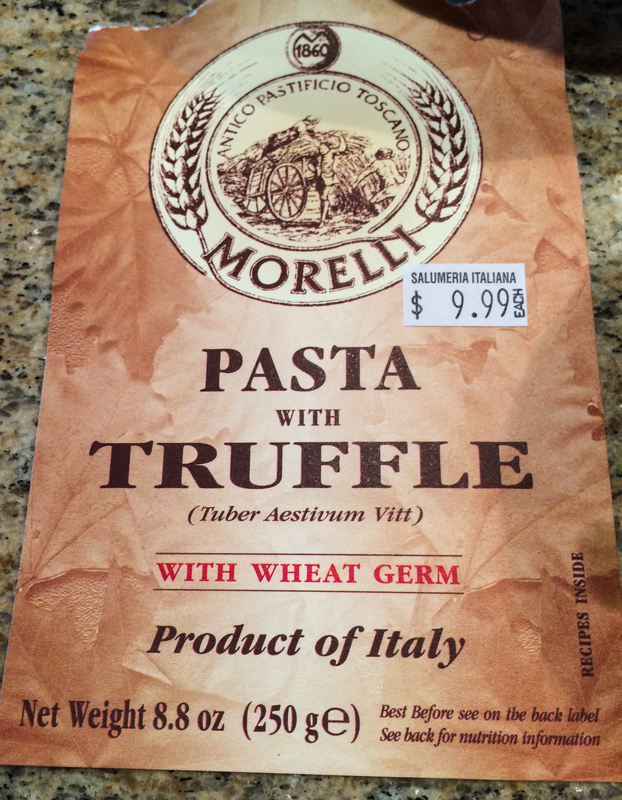 The grocer I rely on there is Salumeria Italiana, and I also picked up a package that looked intriguing: pasta with truffle, a tagliolini by Morelli. 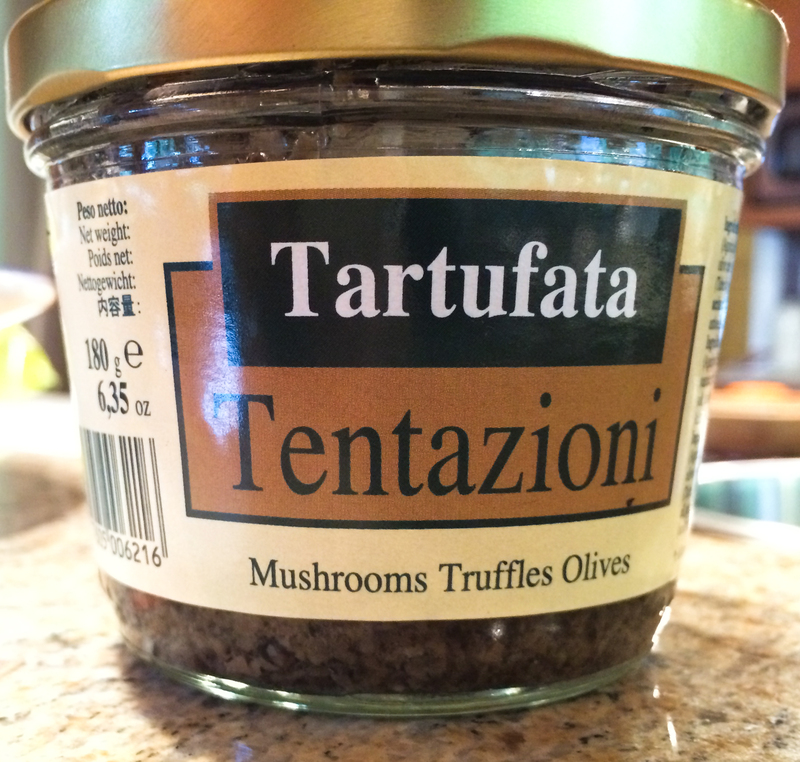 I decided that this would be stupendous with Tartufata, a mixture of cooked porcini, black olives and truffles, also from Italy. 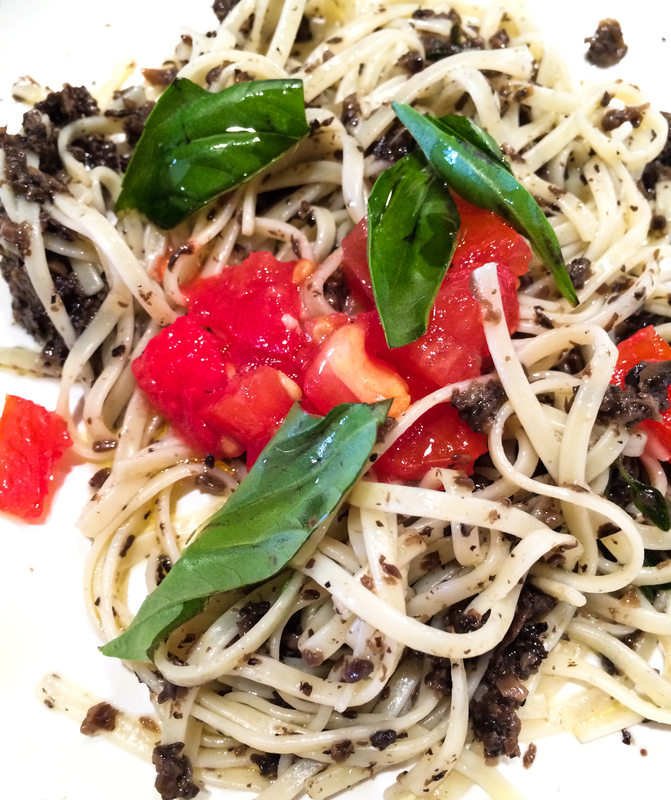 It was easy to do: boil the pasta (which cooked very quickly), toss with tartufata and reserved pasta water, add some chopped up marinated tomatoes, a few basil leaves, salt and pepper and a drizzle of olive oil. Pair it with a bottle of 2011 Riecine Chianti Classico, a stunning raw and natural wine from John at Social Wines, and be very happy that you are alive on your birthday to enjoy it all. 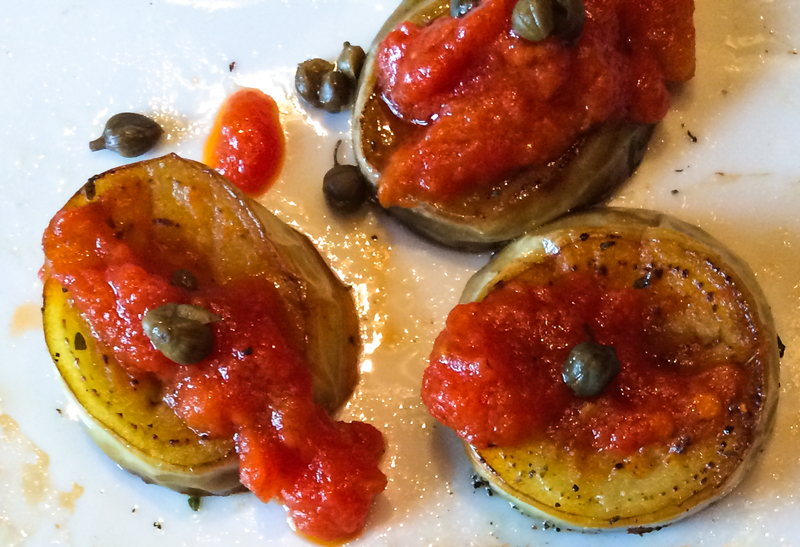 White Eggplant and Tomato in the Style of Santorini. Today was a quiet Sunday. At the farmers market in West Acton I bought a few things, and the most interesting was a white eggplant variety, similar to one I had in Santorini. So I made a late lunch with this, and some of my other favorite items of the week — new red potatoes, and cooked red Tolosa beans from the Basque country of Spain. 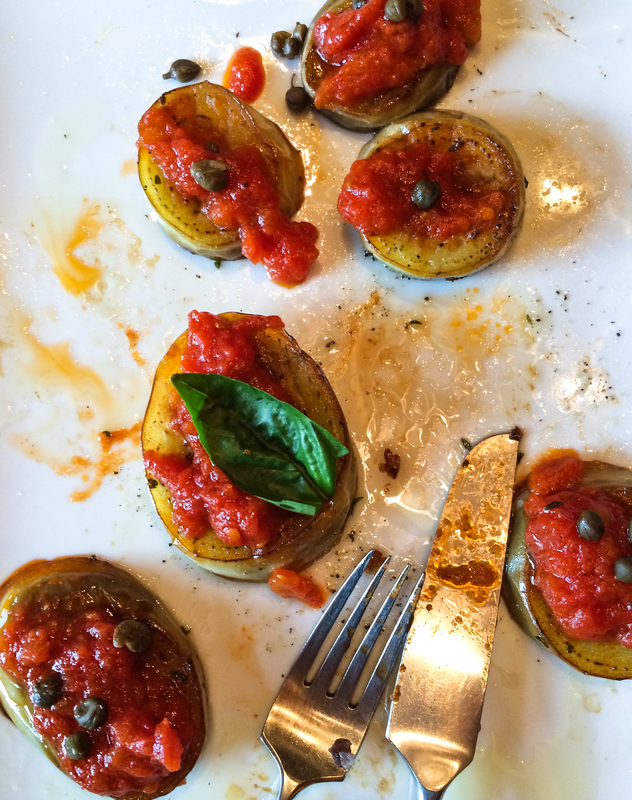 This eggplant was quite firm, with very few seeds, so it took quite awhile to soften and be fully cooked, using a non-stick skillet and several glugs of olive oil from Puglia and lemon thyme from our garden. I removed the cooked eggplant to a serving platter, then heated some more olive oil (first flavored with three cloves of garlic) and made a rich, thick tomato sauce with peeled chopped fresh tomatoes (2), canned Italian tomatoes (3) and juice, and 2 tablespoons of double-concentrated tomato paste from Santorini. 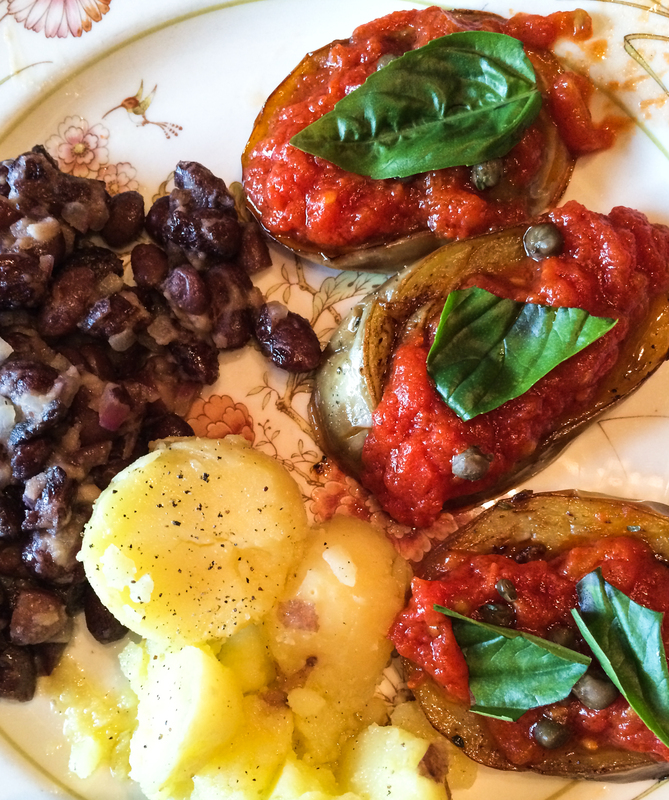 The sauce was cooled and then layered atop each slice of eggplant, and topped with salt-packed Spanish capers which had been rinsed and drained a few times. The Tolosa beans had been cooked the day before, so they just needed to be heated up with finely diced red onion and olive oil, and the potatoes were simply boiled until tender, peeled, and seasoned generously with olive oil, salt and pepper. 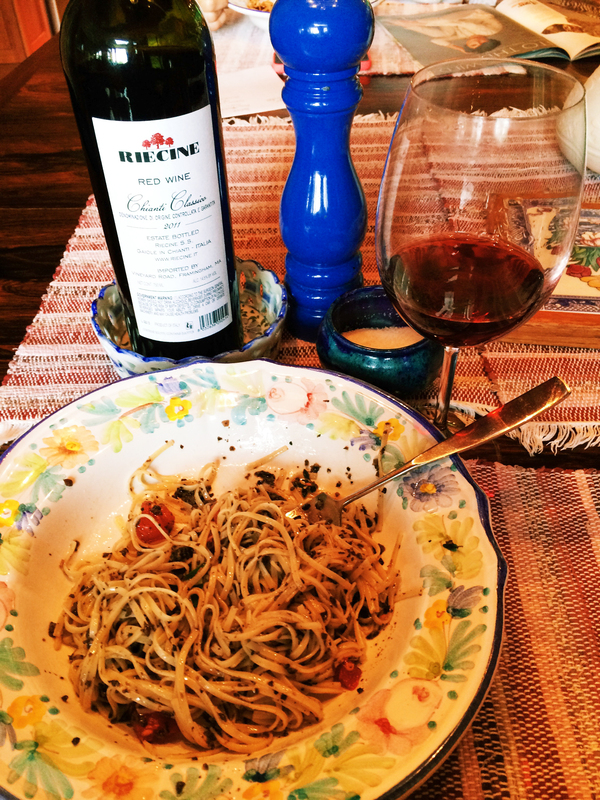 The wine was perfect for it — the rest of the bottle of Riecine Chianti.